Most of the time, diarrhea is caused by a virus or bacteria and will clear up on its own within a day or two. In the meantime, you can avoid irritating your stomach and help the diarrhea pass by staying hydrated and eating bland, soft foods. If you see blood in your stools, have diarrhea for more than two days, have severe pain in your abdomen or have a fever of 102 degrees Fahrenheit or higher, see your doctor. The most important thing to remember if you have diarrhea is to keep yourself hydrated. Diarrhea may cause you to lose too much fluid, causing dehydration. Sip water, tea, clear sodas and clear broths. You can also sip an oral rehydration solution, which contains the sugar, salt and potassium that your body needs after a bout of diarrhea. The symptoms of dehydration include thirst, dark urine, dry skin, fatigue and light-headedness. In babies, symptoms include crying without tears, a dry diaper for three hours or more and a sunken fontanel, or soft spot in the head. If these symptoms occur, contact your doctor. After the first several hours of a bout of diarrhea, the frequency should begin to slow down, and you can gradually introduce bland foods to your diet. One way to remember foods that will nourish you and allow you to recuperate is to think of the acronym BRAT, which stands for bananas, rice, applesauce and toast. 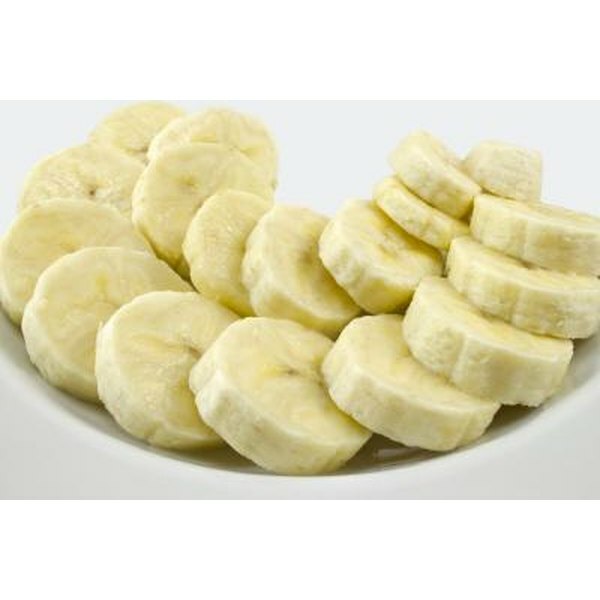 Bananas contain potassium, which you may have low levels of after having diarrhea. Rice, applesauce and toast are easy to eat with an upset stomach and are unlikely to cause more diarrhea. While you are sick with diarrhea and in the days immediately afterward, avoid greasy, heavy foods, which may cause more diarrhea. Also avoid milk and other dairy products, as you may become temporarily lactose-intolerant when you have a bacterial or viral intestinal illness. Foods with a lot of sugar or fat might also start diarrhea again and should be avoided. After three days, gradually introduce the foods that you normally eat. Some diarrhea is caused by a condition called irritable bowel syndrome, or IBS. Its symptoms include chronic diarrhea, sometimes alternating with constipation, abdominal swelling and white mucus in the stool. If you have IBS, your doctor might recommend eating more fiber to alleviate your symptoms. Eat foods such as fresh fruits and vegetables, beans and whole grains. Another option is to take a fiber supplement or to mix fiber-containing powder with water or juice. What Can You Eat for Breakfast If Fiber Makes You Feel Bloated?